Gelid shows off its ICY Vision-A, a new graphics card cooler with five heatpipes and two UV Blue fans. This model is compatible with AMD Radeon HD 5830, 5850, 5870, 6850, 6870, 6950, 6970, 7850, 7870, 7950, and 7970 graphics cards. Thermal Solutions specialist GELID Solutions eexpands its mmulti-award wwinning “ICY VISION” VGA Cooler on the latest graphic cards of AMD™ (reference board of HD 7950 & HD 7970). This neew product is dedicated exclusively to AMD™ VGA ccards. The “ICY VISION-A” cooler contains 5 power heatpipes inn a unique heatpipe constellation. Thhe heatpipes are interlaced into 85 opptimized high-quality Aluminium fins. Together with a flat stack fin soldered Copper base, they enable the most efficient heat transmission and dissipation from GPU core in its class. Besides the heatsink, two 92mm UV-reactive fans with 11 blades in S-shape generate 20% more air flow than traditional fans. The fan contains a high-quality ball bearing to ensure a longer lifetime in high temperature environments. The “ICY VISION-A” is CrossFire™™ and compatible on a number of cards. More RAM and Voltage Regulator Module (VRM) heatsinks are included to cool down the components around the GPU. The high performance GC-2 thermal compound is also included in the package. 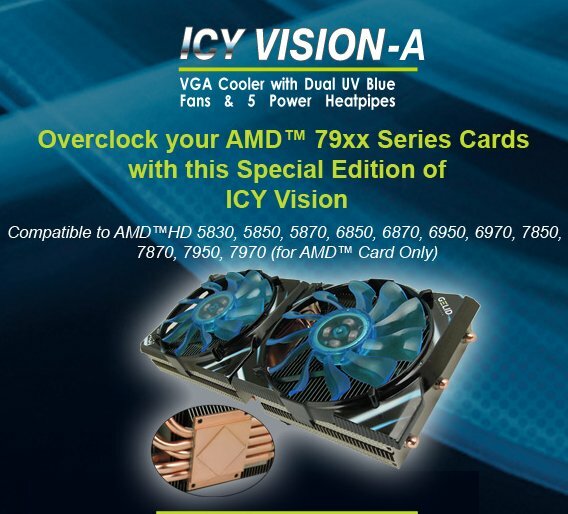 The “ICY VISION-A” VGA cooler is available now and has a MSRP of USD 55 or Euro 46. This cooler is RoHS, WWEE conform and carries a 5 year warrranty.